Are your trees looking a little wild? 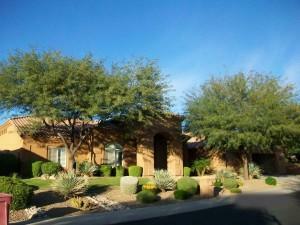 Call us for tree service in Phoenix! With proper tree service, Phoenix residents can ensure the longevity of their vegetation and personal safety. 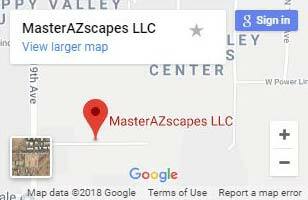 Arizona gets hit by gale force winds frequently and having trees correctly maintained by MasterAZscapes LLC landscapers will keep them from becoming hazards to not only you but your property. Keeping trees properly pruned also keeps them healthy and ensures they are growing the way you want them to. Our certified arborists will take care of all your trees and ensure they are healthy and ready for vibrant growth. Trees that are top-heavy with many years of growth can be considered a dangerous liability. Arizona gets hit with gale force winds by micro bursts or monsoon storms and most top heavy trees often end up on your home, car, building, and other unwanted places like outdoor kitchens. Without tree service, Phoenix trees that are top heavy may split at the crotch because of the overbearing amount of weight. To prevent these tree disasters, we can provide you with crown cleaning or crown thinning to reduce the amount of deadwood and overgrowth in the tree canopy. Cross branching is another issue that results in open wounds which could cause diseases or invite insects and other problems. By utilizing our professional tree service, Phoenix property owners can take advantage of periodical tree pruning that will reduce the risk of tree damage and tree disease as well as maintain vibrancy and health. Damaged trees are more of a hazard and liability than an eye sore. Dead and dying trees are an open invite to insects and diseases, this may cause issues for other trees and even your home. Trees that have heavy limbs from over-weighted canopies will cause limbs to split and can be hazardous to your property or worse your neighbors or customers. We offer precision cuts and large tree removals along and clean up any debris. If your tree is a danger, one of our certified arborists can evaluate your tree to identify the most beneficial solution to the problem. Our staff are experts when it comes to tree service, and they’ll use their knowledge and experience to remedy your situation. Have a sick palm tree? We’re the specialists you’ve been looking for! Tree service is a lot more than just watering. Phoenix soil is full of sodium and calcium but lacks what a tree really needs. In order to get needed nitrogen, phosphorus, potassium and so forth, the tree must be fed at the root structure. This will result in the stimulation of growth and more vibrant foliage. 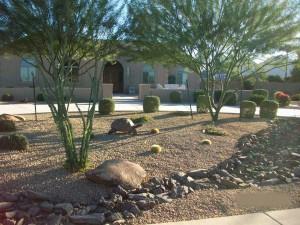 We provide deep root fertilization as well as other fertilization treatments for all your palm and tree service needs. If your palm or tree looks dry and are showing signs of stress, give us a call so we can give your palm or tree back a vibrant and healthy look. Remember a healthy and vigorous tree that is fed properly will help keep fungus, insects, and disease from attacking. What are some common symptoms in a sick tree? What solutions can you provide? Call us Today for a FREE TREE DIAGNOSIS or any other landscaping needs!